I was going through old issues of Family Fun Magazine last night and came across this recipe which somehow slipped through the cracks. Why didn’t I rip it out earlier? It’s a maple version of one of my favorite type bars. After making a half batch this afternoon, I checked to make sure the full batch (13×9 inch) version was still on-line. It is and you can find it on Family Fun. For a half batch, I used the ingredients and method below. They were delicious and the maple flavor was a nice change from the usual honey. There could have been a higher ratio of syrup to pecans, but I like pecans and the full cup was fine. If you don’t have a full cup of pecans on hand the recipe should still work. Preheat oven to 350 degrees F. Line an 8 inch square metal pan with foil and spray the foil with cooking spray (or use non-stick). Mix the softened butter, sugar, and salt together with a wooden spoon. Stir in the oats. Add the flour and stir with the spoon until crumbly, finishing it off with your fingers if needed to make sure it’s mixed. Sprinkle in some water. Press crumbles into bottom of pan and bake on center rack for 15 minutes. Let cool. Melt the butter in a medium saucepan. Stir in the tiny pinch of salt (if using) maple syrup, brown sugar and cream. Bring the mixture to a boil and boil for no more than 30 seconds. Remove the pan from the heat and stir in the vanilla and pecans. Pour the maple pecan filling over the crust, spreading it evenly with a spoon. Bake the bars on the center oven rack for 15 minutes. Transfer the bars, in the pan, to a wire rack to cool thoroughly. Cover and refrigerate the bars for 1 to 2 hours before slicing. Jen, that’s a good question. Rebecca’s bars are more like pecan pie. If I remember, they have more filling/topping. These bars have a higher nut to syrup ration and the stuff that surrounds the nuts is thicker and more caramel-like in consistency. There are no eggs to soften it up. I’d say it’s more like the old “pecan triangle” recipe which uses honey, butter and (sometimes) cream. 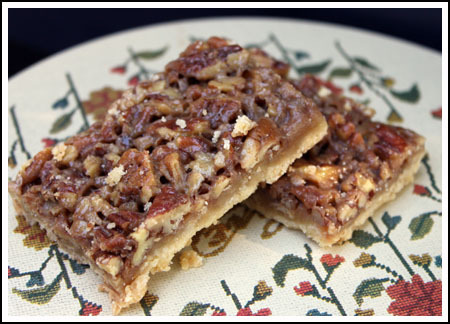 How do these compare to the Rebecca Rather Pecan Pie Bars? Just love maple and nuts-these look fabulous! Yum! I love maple, and nuts = one to try!